The 70 cultural antiquities which were seized recently in Macedonia (Northern Greece) were likely to travel in order to be “discovered” some day in FYROM, the newspaper ToVima reports. These seized cultural antiquities who were linked with ancient Macedonians, an ancient Greek tribe, dated back from the 5th century BC. Archaeologists and Officials of EL.AS. (Greek Police) are considering them extremely significant. 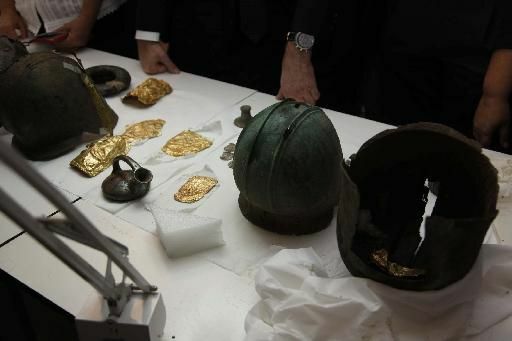 The looted antiquities were seized after the spotting of a network of antiquity looters by the Greek Police in Macedonia. This network of smugglers who had been active in Macedonia and the rest of Northern Greece, had already attempted to sell the cultural antiquities for about 10 million euros. Officials from the Greek Police expressed their fears that the antiquities would be sold by the network of looters to buyers from FYROM. So that the latter would “present” later the stolen antiquities from Macedonia in Greece, as being their own who had been “discovered” in their soil. This way they would promote their petty propaganda claiming to have links to ancient Macedonians. Greece and FYROM have been tangled in a ongoing dispute regarding the latter’s name, after FYROM’s Slavs absurdly keep claiming the Name, history and heritage of ancient Macedonia, an ancient Greek kingdom in Macedonia, Greece.